46 LC DBM Equipment Parts / Mower Blades Parts / Small Engines & Equipment Parts / Truck Accessories Parts / Turf Equipment Information Request # 9156 Wood Bay Turf Technologies www.woodbayturftech.com 800-661-4942 Manufactured to fit OEM heads including: Toro, John Deere, Jacobsen, R&R Products, Graden, Redexim, First Products and more... Convert that old mower into a dedicated verti-cut mower! Check out our blade specifications to find the right blade for you. 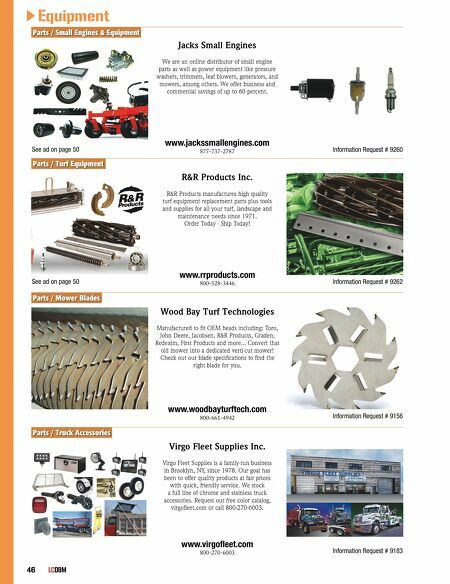 See ad on page 50 Information Request # 9260 Jacks Small Engines www.jackssmallengines.com 877-737-2787 We are an online distributor of small engine parts as well as power equipment like pressure washers, trimmers, leaf blowers, generators, and mowers, among others. We offer business and commercial savings of up to 60 percent. Information Request # 9183 Virgo Fleet Supplies Inc. www.virgofleet.com 800-270-6003 Virgo Fleet Supplies is a family-run business in Brooklyn, NY, since 1978. Our goal has been to offer quality products at fair prices with quick, friendly service. We stock a full line of chrome and stainless truck accessories. Request our free color catalog, virgofleet.com or call 800-270-6003. 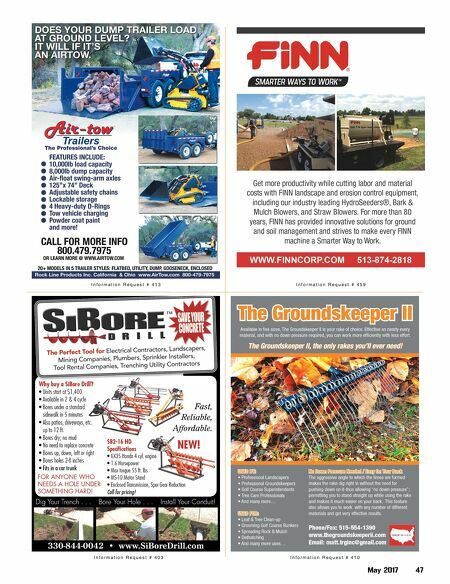 See ad on page 50 Information Request # 9262 R&R Products Inc. www.rrproducts.com 800-528-3446 R&R Products manufactures high quality turf equipment replacement parts plus tools and supplies for all your turf, landscape and maintenance needs since 1971. Order Today - Ship Today!